Don’t you just love finding out information and clues that reveal the mystery of your life path and destiny? There are so many ways that you can find snippets of profound information that you can compile together to create an ‘aha’ moment in your life as you discover why you do the things you do, and experience the things that happen to you. Understanding your life path journey can help you make better decisions in your life, and while it’s probably not going to prevent you from making mistakes, it will help you to refrain from making mistakes that might lead you too far away from your destiny. Which will help you create a life that feels aligned with your purpose and fulfilling. Here’s everything you need to know. Are you looking for a Personal Chinese Astrology Reading? Submit your card details to enjoy 4 FREE Minutes & 50% off your first reading. 1 Are you looking for a Personal Chinese Astrology Reading? 2 What is a Chinese Astrology Reading? 5 What Are The General Meanings Of Each Of The Chinese Zodiac Signs? 6 Who Is A Chinese Astrology Reading For? What is a Chinese Astrology Reading? A Chinese astrology reading will provide you with information about your destiny and life path, which will focus on how you will grow and evolve throughout your life, according to your birthdate, alignment of the planets and Chinese animal zodiac at the time of birth. It reveals information according to the astrological climates in the same way that western astrology does, but the Chinese zodiac signs, principles and cycles differ which produce a very different reading than a western reading. Chinese astrology generally focuses on five classical planets which are aligned with the Wu Xing Teachings and also incorporates yin and yang principles and other Chinese principles that are not present in Western Astrology. While the same elements of a birthdate are used in both Chinese Astrology and Western Astrology (date, time, place of birth), that’s probably the only similarity. Chinese Astrology also uses a Luni-Solar Calendar with cycles last 60 years which are developed by two separate cycles that interact with each other, and it’s these cycles combined with the planets alignment at the time of birth that can show your Chinese astrology reader what is happening in your astrological chart. The five elements combined with the ten heavenly stems in their yin and yang forms. The combination of cycles creates the sixty-year cycle mentioned above. The cycle always starts with Yang Wood Rat and end with Yin Water Pig. This cycle also means that each zodiac animal will occur in either Yin or Yang. For example, the rooster can only appear as yin. This is because the amount of zodiac animals is twice as high as the number of elements which appear both as yin and yang. 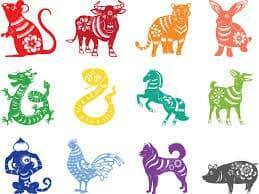 Each of these zodiac animals, along with their elements and planet positions will create a unique reading for each birth date and is how a Chinese Astrology reader can aid you with your questions about your life path and destiny. What Are The General Meanings Of Each Of The Chinese Zodiac Signs? People born under this the rat zodiac sign are said to be blessed with high intelligence, quick wit and sharp intellect. Which is why you often find rats excelling in their work as entrepreneurs. They are also charming and funny. Those born under the animal zodiac sign of the ox are powerful and can be aggressive and stubborn. But they are also loyal and sincere, thoroughly enjoying the company of their family and friends. A tiger might seem to be fierce, but a tiger zodiac sign is one of the sweetest and most charming of all (which is also the other side of a real tiger that most don’t get to see). Tigers are born leaders, are highly ambitious but their courage has no boundaries, and they can be quite intense! Rabbits are social creatures often craving the company of others. They love being around the family and friends; they like being at home and love is a source of high strength to them. They are sincere and compassionate to all things which makes them fascinating to other animal zodiac signs. Dragons are extremely lucky in love, and they know it. They are very egotistical, but they are also warm natured and compassionate. They can light up a room are natural leaders and can be great team players too. If your animal zodiac sign is a snake, you are likely to be quite introverted, but also charming and very seductive. You don’t mind working hard, and often have uncanny hunches that often come true. You are quick thinking and if you wanted to could outsmart anybody for better or worse. The horse zodiac sign influences those under its spell to be independent and to adore freedom. They are the travellers and adventurers, they are highly energetic but are also impatient and have to assert themselves to get things done constantly. Goats are profound thinkers and philosophers. They enjoy analysing before taking action and are incredibly creative. But they could over think and as a result could develop anxiety. Monkeys are usually very happy, and an uplifting personality with unlimited energy but they do lack self-control. Monkeys like to have lots of fun which mean that they can have a propensity toward breaking hearts in love and friendship. They don’t excel at long-term relationships. Roosters are practical and can out-think the best of them; they are also observant with a straightforward attitude which makes them excellent at making decisions. They are also quite the perfectionist! Dogs are trustworthy and very loyal, you will be very unlikely to be deceived by a dog. They also have high intellect and are sensitive emotionally. They might not be the greatest lovers, but you’ll know that they tried their best. Pigs are selfless philanthropists who warmly express kindness to others – in buckets. They are highly attractive to others because of their sweet nature. They are brilliant and incredibly charming. Who Is A Chinese Astrology Reading For? A Chinese Astrology reading is good for anybody who wants to learn about their life path and destiny. Here are some things that you might find out from a Chinese astrology reading online but please note that this list is only an example of some of the things you might be able to explore. Why you might keep having the same experiences over again. How you express yourself and how others may experience your self-expression. Who you might be compatible with romantically as well as with friends, colleagues or business partners. Challenges that you face in life. What drives you to do, think and behave as you do. How you manage and experience your life. What your romantic prospects might be. How you will handle wealth, fame or children. What dates are the best to get married, open a new business or host any other kind of significant event? How to harness good energy in your life path to create the life you want. Typical types of health problems you might face and how to correct them. Why you don’t get along with your parents, siblings, colleagues or children. To forecast what is likely to happen in your life over the coming weeks, months, year. You can also find out information about specific events or relationships which will help you to understand the situation better as you experience and hopefully guide you toward making beneficial choices. Whatever the outcome you’ll enjoy the reading, it will provide you with new insight about yourself and fill you with hope for a positive future. The questions you ask will determine the quality of your reading. If you ask for a general reading but are hoping that your Chinese astrology reader will intuitively respond to a situation or secret, more detailed question, then you might be disappointed. If you want to find out the general details that show up on your Chinese Astrology chart, then that will make a fascinating reading, but you’ll only need to do this once (at least per Chinese astrology reader – because they will all have different styles, interpretations and ways of delivering information to you). Then you’ll need to ask for general Chinese astrology reading about your birth chart. But if you want to find out about how compatible a relationship is, or what the forecast is likely to be for the next three months, then you’ll need to ask for this information specifically. If you think about what it is that you want to know in an ideal situation, and you focus your questions to your Chinese astrology reader accordingly, you should end up being very satisfied with your reading. Especially if you choose a reader from one of our favourite psychic sites (because they’ve already been tested for their abilities!). There are some great Chinese astrology readers online, and there are plenty of options from one of our preferred sites. Here are the links. Get clarity about your life right now. Improve your confidence and esteem by learning that some things are not your fault! Your reader may not provide you with information about the energy around your right now such as decisions of others. Your life path may not match with your dreams, but when you are on your life path, you’ll feel at peace. Are you ready to take the plunge and try out your first Chinese astrology reading? Life Reader – 4 free minutes and 50% off your first order.